Two Robert Juliat Merlin 2500W and two Robert Juliat Aramis 2500W followspots served as front of house support for the duration of the two-week Cap Roig Spanish music festival. This is the 6th edition of the festival and it ran from 7th July to 22nd August 2017 in a site spread over 17 hectares of gorgeous gardens. 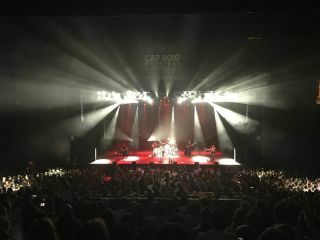 The line-up of singers and bands included Anastacia, Passenger, Silvia Pérez Cruz, Norah Jones, Wilco, Woody Allen, Els Amics de les Arts and The Pretenders. Merlin and Aramis are two of Robert Juliat’s most popular followspots. Local rental company ABS Entertainment Service rigged two of each on front of house towers for maximum effect. From here, Merlin and Aramis were put through their paces and showed themselves able to cut cleanly through the lighting from a large rig of moving lights and haze, demonstrating their extreme capabilities and proving perfect for the job. Both Merlin and Aramis are ideal for a festival such as Cap Roig. Merlin in particular is designed specifically for touring and music events. Powerful and rugged, it has a massive 3° – 12° zoom that make it uniquely suitable for both medium and long range applications in one followspot. Aramis is, of course, an old favourite: its 4.5° - 8° zoom and durable construction withstands the rigours of touring and is well-suited to long throws in large venues, both in and out doors.